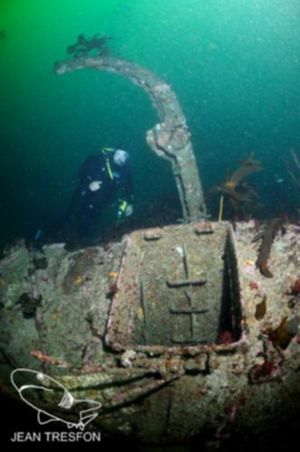 The dive site SAS Gelderland is a recent wreck in the Karbonkelberg headland area on the Atlantic seaboard of the Cape Peninsula, near Cape Town in the Western Cape province of South Africa. About halfway between the rock known as "Die Middelmas", off the Oude Schip point to the north, and the offshore rock at Duiker point to the south. There are two main sections of wreckage known. The central section of the hull with the engine room is at the position given, and the bow is some distance away to the south. 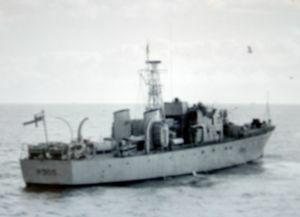 The "SAS Gelderland" was a Ford class Seaward Defense Boat, formerly the HMS Brayford, renamed on 30th August 1954. The ship was named after the Dutch battleship that transported Paul Kruger to Europe in 1900. The SAS Gelderland, was scuttled at 10 am on 21st December 1988, North West of Duiker Point, by demolition trials. The vessel was about 40m long but the main section of wreckage is now only about 20m as the bow and stern sections were blown right off when scuttling it. The midships section lies moderately intact and upright on the sand at 35m. There is a reef of huge boulders with some great reef life to the north and a pinnacle which rises to 12m is fairly close by. Unfortunately the superstructure and funnels are gone and much of the hull has filled with sand. Geology: Sand bottom with outcrops of granite reef of the late Pre-Cambrian Peninsula pluton. The site is exposed to south west and north west swell end winds, but is reasonably sheltered from south easterly winds. The site is diveable in low to moderate swell height as long as the wave period is short. The site is usually at it's best in summer but there may also be occasional opportunities in autumn and early winter. This is an area which sometimes has upwellings, caused by the south easterly wind, resulting in cold clean water, and which may be followed by plankton blooms, which will reduce visibility again. If the south easter blows strongly, the trip back will be wet and uncomfortable. The site can only be reached by boat. It is about 7.5km from the slipway at Hout Bay harbour. Fairly recent wreckage of small naval vessel. No particular routes recommended. The site is small. Ability to deploy a DSMB is recommended. Training/certification to dive below 30m is required. Reel with DSMB, Light, Nitrox and Dry suit recommended. This page was last edited on 5 December 2011, at 09:44.